Today it's snowflakes and icicles..... brrrrrr!!! But that couldn't be further from the truth here in Queensland. Snowflakes wouldn't last a minute here in our warm Summer weather. I love that we have Christmas in summer in Australia, but I have to confess that Hollywood has me completely sold on the romantic notion of a "White Christmas". So for those of you in the northern hemisphere who are already feeling the bite of winter, and those of us in the south who are just dreaming of a white Christmas, this one is for you! 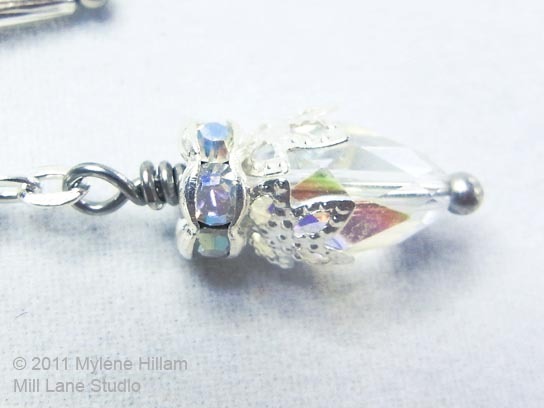 Thread one of each of the teardrop crystals onto a headpin. Place an adjustable bead cap around the base of each crystal and then cup it around the bead. Thread on a rondelle and then create a wrapped loop. Remove 3 links and 10 links from the chain . Connect the 3 links to the turquoise crystal and the 10 link length to the AB crystal. You will need to open the links of the chain to do this, or you can add the chain to the wrapped loop before you wrap it. Place the hollow tubes on head pins and turn a loop. 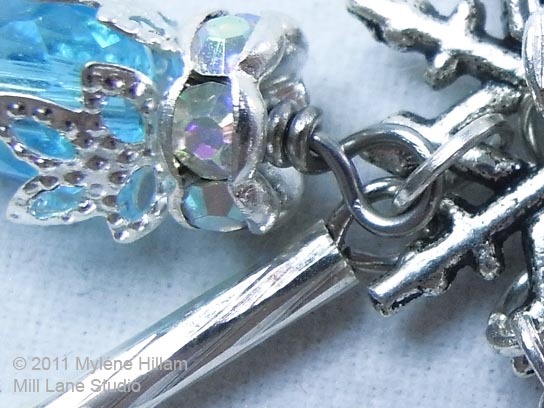 Attach the components to the jump rings as follows: the light sapphire crystal and the 20mm hollow tube; aqua crystal and the 30mm hollow tube; and the AB crystal on the 10 link chain. Attach the jump rings to the open spaces of the snowflake. 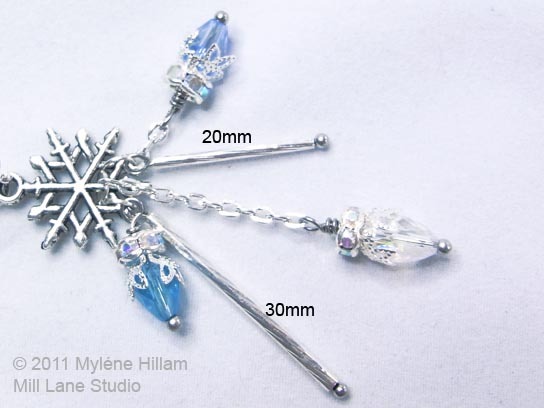 Connect the top of the snowflake charm to the ball end earring wire and gently press it closed. 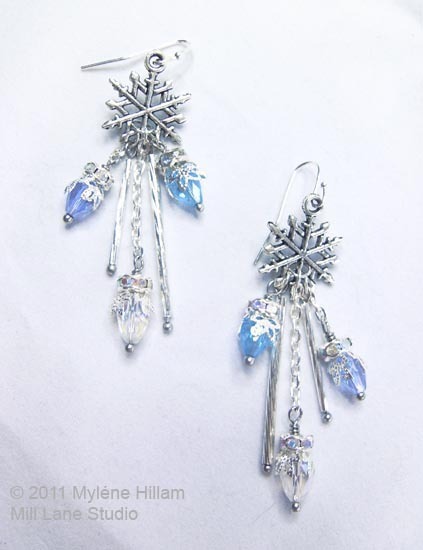 Make up the second earring in the same way and you're ready to wear your pristine Snowflake and Icicle earrings. If you love these earrings, look out for my other Christmas Earring designs in the Twelve Days of Christmas Earrings series. Each ebook has twelve pairs of festive earrings ranging from cute and adorable to elegant and chic. There are so many different looks to choose from that you are sure to find lots of designs you like. Purchase now and download immediately so you can get started making your holiday earrings straight away!